Probably the journal that Jones of the Franklin Institute used as a model for his own American Mechanics' Magazine was this British journal began in 1823 by J. C. Robertson. He was the editor, but not publisher, of the Magazine and expressed a lively interest in the advancement of scientific (by which he meant "engineering") knowledge. 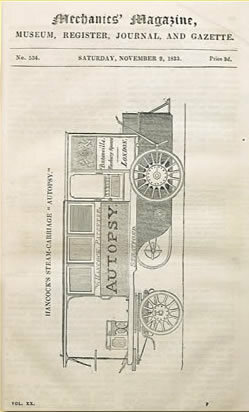 The magazine featured "original papers" (in the form of letters to the editor), patent summaries, notices of novel inventions or events, critical reviews, and "inquiries and answers" in which readers asked for advice of a technical nature.